Crochet Afghan Backgrounds - Turning the results of Kaleidoscope Painter into afghans. This tutorial uses filters from Simple Filters and Teph's Tricks as well as a mask (supplied) and is more a starting point than a strict method. Battenburg Lace - How to make Battenburg Lace with dingbat fonts, layers, and Blade Pro. Bishop's Sleeve Drapes - Make Bishop's sleeve drapes and simple three part tassels using Jama 3D. FilterMunky Super Toot for March 2002. Braids - Part One - The simple secret to creating braids. Make a section of straight braid with any number of strands. Braids - Part Two - Braiding in the round. How to braid a circle and tips on braiding other shapes. Brandy Snifters - How to make a brandy snifter or any other blown glassware from a waterdrop. Brandy Snifters from Vector Shapes - Another tutorial for making brandy snifters, this time entirely with vector shapes and gradients. This is a PSP7 tutorial and assumes intermediate to advanced knowledge of the Styles and Colors palette, vector tools, and node editing. Drilled Glass Beads - How to make semi-transparent drilled beads and an angular placement tube to string them. Uses PSP7 (older versions should work) and one filter. Easy Patterned Beads - Wrap paintings, patterns, photos and other images onto beads. Written for PSP8 with notes for PSP7. 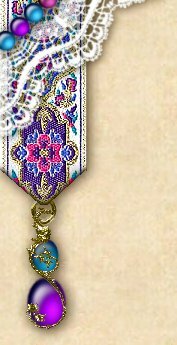 Embellishing Beads - Etch, onlay, and inlay designs onto beads. The tutorial uses a drilled bead tube in order to demonstrate how to align designs with the direction the bead strand is drawn. No filters are required. Eyeglasses - How to make eyeglasses with Blade Pro, masks, and layers. Faceted Gems - How to make semi-transparent, faceted gems with Super Blade Pro and layers. Glass Domed Frames - How to make framed images like the one at the corner of this page. Three methods, using a tube, a downloaded file, or Eye Candy. Marble Columns - Make polished marble columns with carved capitals with Blade Pro, dingbats, and assorted PSP tricks. "Painted" Shoji Screens - Shoji are Japanese wood and paper doors. Linked free-standing panels are used as room dividers. This is how I made some "painted" shoji for the layout of the LiveJournal community I co-maintain. Pearl Strands - How to set up tubes to make strands of pearls. Seamless Tiles - Make 20/20 style seamless tiles with a mask and Half Wrap. Includes a short lesson on user defined gradient fills. "Tin Cup" Necklaces - Making "Tin Cup" necklaces with bead and rope tubes. A simple closed clasp effect is included. In hopes of reducing some of my email (and the associated guilt at not being able to answer all of it in a timely manner) I'm going to state my policy on using my tutorials in forums and mailing lists. I always approve text links to my tutorials. I recommend linking to this page or my main PSP page at psp.tephras.com since individual tutorials may move if I get into a cleaning fit. If you just have to have an image to use with your link you may use one of the link buttons from the main page or make your own image from the tutorial you want to share. Do not repost tutorials in any format. This includes paraphrasing them and putting them up with your own images. Attempting to reduce them to just text to put them in a forum is not approved either. Do not link to images on my site. Doing so steals bandwidth from the server hosting my pages. Do not charge people for using my tutorials (this means no using my tutorials in subscription mailing lists or forums, sorry). If anyone should get paid for my work it's me. A word on translations. I approved one translation, into French, and was never informed if the page was ever completely translated and was never given a link to it. Since I don't know the status of that page I no longer approve of the translation. I have seen other, unauthorized, translations in other languages. If you see any of my tutorials in any language other than English know that I have not approved of it. All graphics and tutorials ©1999-2007 Lynn A. Davis unless otherwise noted.